Rated 5 out of 5 by brouse0122 from Love the game, competing worldwide I bought the game years ago, need it again back on my laptop! Rated 5 out of 5 by deddu from Jewel Adventure Great game with lots of boards: There are five stories - Rupert's Heartbreak, Emma's Apology, Bernard's Revenge, Hani's Regret, and Back to Africa. Each board has progressive levels 1-5, 2-6, 3-7, 4-8 and 5-10. The higher you go the more challenging they become. 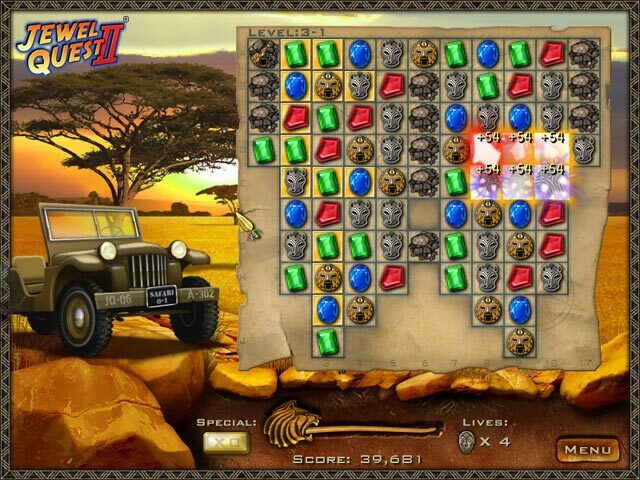 Rated 5 out of 5 by Deejaycee522 from A Great Match 3 from Long Ago This is one of Jewel Quest's greater games. It works well on Windows 10. It is very challenging. 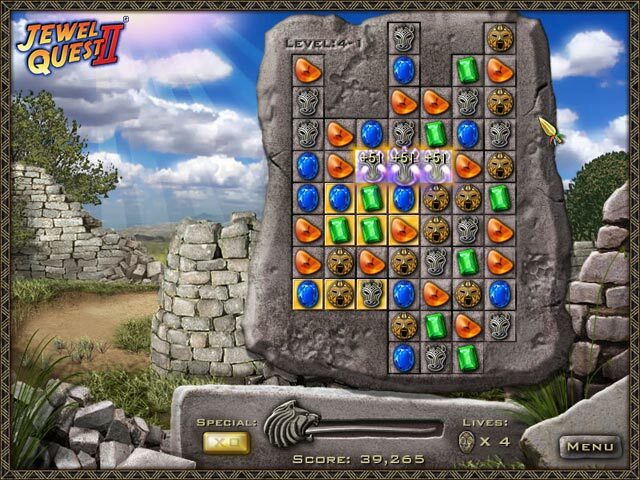 You have to match 3 or more gems of the same type in a certain amount of time to advance to the next level. It's more than just a match 3. You have other challenges such as revealing hidden gems. Gold coins are revealed at certain times and when you match 3 golden coins, you earn a point. When you get stuck, you can use one of your points to eliminate a gem. 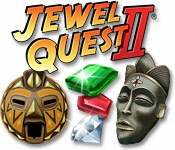 There are other great Jewel Quest games, but this is one of my favorite. Rated 5 out of 5 by lulabell56 from Favorite Match 3! After owning this game for several years, I still go back to play this game again and again. I don't really read the story every time I replay. I just try to beat myself from the previous game. It's a winner. Rated 5 out of 5 by millooneyum from Absolutely one of the best match 3 games ever. This is one of the best match 3 games ever developed. I have played through it a dozen or more times. Challenging and fun. The story line is very engaging. Tournament level is fantastic. You play against people around the world in real time. This is my favorite part of JQ2. The only annoying part is the music. Luckily, you can mute the music without muting the sound effects. Rated 5 out of 5 by spielemaus47 from I like these games Some of these games I bought in German, but this I bought in English. It's a fight with myself and somtimes I try my skills in tounament. Rated 5 out of 5 by Missiongirl from still an excellent game I always like to have a M3 game on the go and my favourites are the Jewel Quest range. As I had completed all the games and I wanted something to play I decided to go back through them. As you would expect they have come along way since they started but I still really liked this one. It had a good level of difficulty without ever feeling it was impossible. If you are just starting out on the Jewel Quest, I would recommend starting with this one. Rated 5 out of 5 by queenumpy from Best Ever I believe this is the best game I ever bought. I've had it for several years and still play on it almost daily. You can play until it gets so hard you can't make it any farther.I'm on super hard 2-1 and I think it's the end of the line for me but I keep trying. 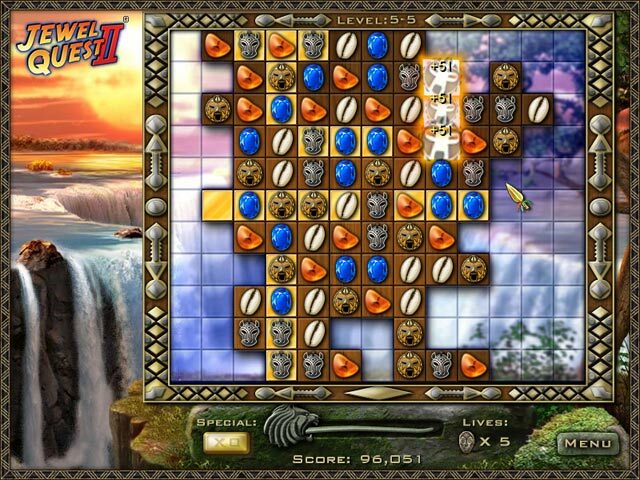 Rated 5 out of 5 by rainbowtree from Jewel Quest II The second game in the jewel quest series, which includes both Quest and Tournament modes. Gameplay requires turning all tiles to gold. Story progresses by way of journal entries using hand-drawn graphics and handwritten notes. Chapters include Rupert's Heartbreak, Emma's Apology, Grenard's Revenge, Hani's Regret, and Back to Africa. Nice progression of boards with increasingly difficult challenges. No option to disable timer, so some boards require multiple tries to master.